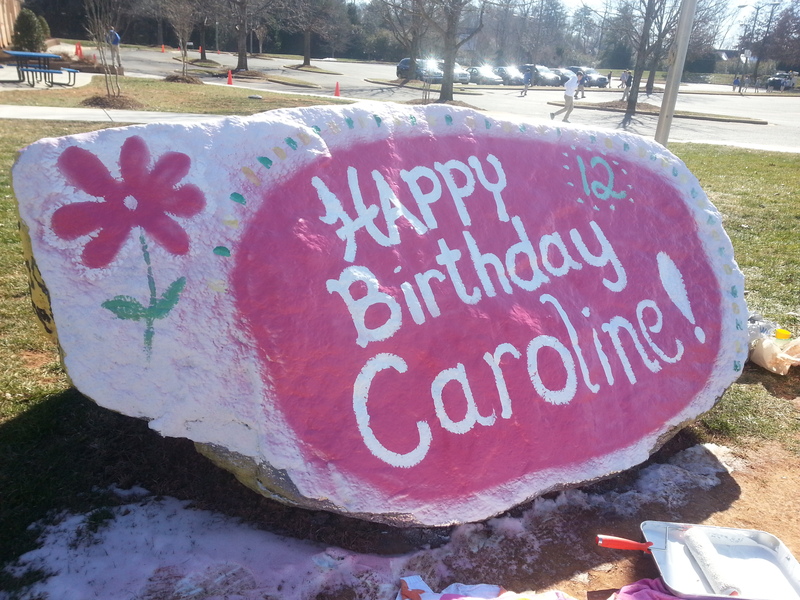 Usually I’m not a big fan of February, except for my daughter’s birthday and Chocolate Day, oops I mean Valentine’s Day. And when you’re in a season of grief, it’s a relief to get through one more day, and especially a string of long, winter days. But as we are halfway between Christmas and Easter, I’ve come to realize that February days are generally void of merriment but they’re not without meaning. These are the days when intentionality is essential to my soul. My lawn is dormant (no grass mowing = bonus!) but my soul can’t be. I must choose to embrace hope in the in-between. So when writer, speaker, and artist Emily Freeman (Chatting at the Sky) asked her followers to consider what they’ve learned in February, I started thinking that this February, probably more than any other, has touched a barren place in my heart with the limitless bounty of God’s grace. 1. I really prefer the summer Olympics over the winter Olympics. By the second week of the Sochi games, my interest had grown, well, cold. But I was struck by 2 things about the Olympics: I really liked Proctor & Gamble commercial about moms who are dedicated to the aspirations of their kids who turn out to be Olympians. But I liked even better the AT&T commercial about the mom who is taking care of her kids and, oh by the way, training to be an Olympian. And while watching the Olympics, it occurred to me that many of the events are focused upon an individual athlete – the figure skater, the skeleton racer, the snowboarder. But in the shadows of the spotlight are hundreds of people who give the Olympians their moment to shine. And success and failure best happen in community. Bronze medalist Erin Hamlin returned to an “Olympic-sized celebration” thrown by her NY village of 600 people who enthusiastically supported her through many years of training. In the 15-K skiathon, Swiss cross country skier Dario Cologna waited 28 minutes after his gold medal victory to congratulate Peruvian Roberto Carcelen who competed with a broken rib and finished in last place. And when Russian Anton Gafarov fell in the cross-country race and broke his ski, Canadian cross country coach Justin Wadsworth jumped into the moment to replace it. These examples remind me that, in my successes and my failures, I’m not alone. Yes, there’s personal effort and accountability, but for the most part I’m intertwined with people that I call spouse, family, friends, neighbors, church, and community. On my best day, gold-medal moments come only with lots of support and encouragement from the people who pour grace into my life. And on my worst day, these people remind me that this is a race for the long-haul, and it’s time to persevere. 2. There’s something about being creative that is so good for the soul. I think it has to do with the image of God. Because God is the Creator, and when I use my hands I remember and celebrate and reflect His creativity. 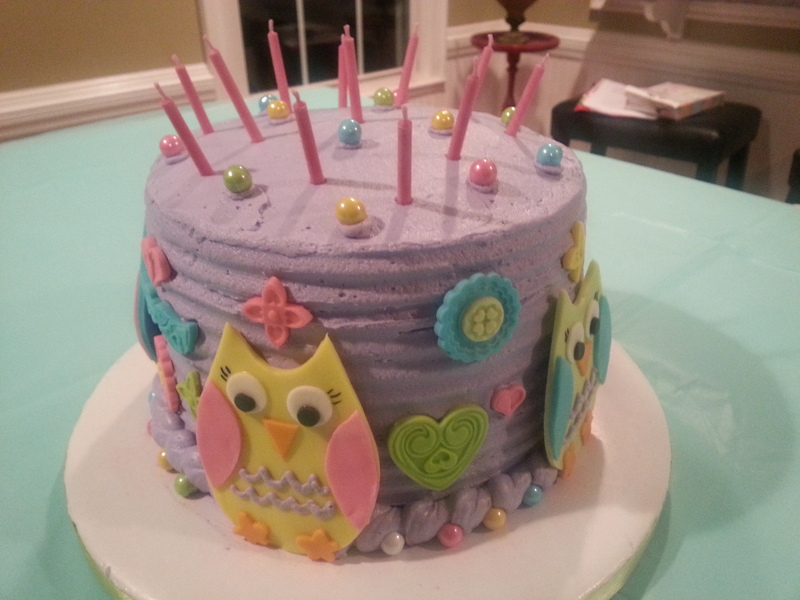 I used to be a crafty person with a little cake-decorating business, but those days are sadly past. One of the happiest, most fulfilling days that I’ve had in a long, long time was the day of preparing for my daughter’s birthday. It reminded me of how my soul craves creativity and art and celebration. As image-bearers, I believe that creativity will be one of those eternal characteristics that we carry into Heaven. I can’t wait to see what that looks like! 3. Flexibility is a component of fitness, physically and spiritually speaking. Stretching involves going beyond the usual range of motion. Maybe it’s trying something new. And perhaps it feels awkward. But flexibility is a learned characteristic that makes my spiritual muscles more pliable. Sometimes I need to set aside my usual routine and range of motion and allow God to move me as He wills and where He wants. 4. Speaking of exercise, faith benefits from a work-out. On February 18 came a question from the daily devotion by Charles Spurgeon, “For how can you know that you have faith until your faith is exercised?” Just a few minutes after reading that, I called my husband to let him know that I really wanted to attend a writer’s conference but I was anxious about the cost. His reply? “Sounds like a time to exercise some faith.” Yeah, he’s a good guy like that. 5. Not a lesson I wanted to learn, but it’s true — girl drama is alive and well among grown women. At least my most recent rejection helps me be more sensitive to my preteen daughter’s fears. So now I’m doing some reading about women in relationships, and I have more studying and writing to do. But for now, let me say one thing – Just Be Nice. 6. The recent epic snowstorm in the South made me realize how easily dissatisfied we are. Within 2 days on social media, the same people who had been pining for the first snowflake were posting status updates along the lines of Get.Me.Out.Of.This.House. Another classic example of the old adage – be careful what you wish for (ahem, preaching to myself). 7. Speaking of snow, I am so glad to be a Southern girl who somehow got hitched to a Massachusetts-raised (ok, Yankee) husband who is not afraid to drive in the stuff. 8. From the Gideon Bible study by Priscilla Shirer, I’ve learned many things, but one thing that has really struck me is the realization that I am simultaneously in the younger and older generation. There are wise women in front of me who are sharing beautiful examples of discipleship, marriage, and motherhood while I am setting a path for women who come behind me. I need to be intentional about creating and maintaining mentoring relationships. This place in life is a gift, and I want to be a faithful steward. 9. It’s a glorious thing when the Body of Christ functions as it is meant to. When tragedy hits someone in my community, my merciful heart serves best when joined with a brain and hands and feet. It’s amazing to see how God provides through the gifts of His people when they operate as one. We are better together. 10. In times of crisis, a cell phone just doesn’t do. Recently, as my mother and I were coming out of a restaurant, I noticed a lady in front of us who seemed disoriented. When she turned to face us, she immediately blurted, “My sister just told me that she has stage-4 cancer.” Without missing a beat, my mother enveloped her, gave me a subtle elbow in the side, and said “We’re going to pray. Right now.” And we did. Sacred moments happen in person. Even with strangers. 11. I have a tremendous appreciation for people who know math, from 6th grade calculations to taxes. 12. The Word of God is alive and rich and unending in its applicability to life. I love to read a familiar verse but see it in a new light. One of my favorites is Isaiah 49:16 – “I have engraved you on the palms of My hands; your walls are ever before Me.” Until just a few days ago, I thought of “walls” in the way of obstacles, frustrations, and figurative mountains in my way. And that made sense to me; of course God gets it when I keep banging my head against sins or hang-ups that hinder me from moving forward in faith. My name is written on His hands, and He remains faithful and compassionate. But then I learned that the “walls” in this verse refer to the rubble of destroyed Jerusalem. And I got a brand new picture – God sees my brokenness. My ruined dreams. My weak places and failures. But God’s purpose is not destroyed. In fact, the very next verse tells me that a plan to rebuild is in place. God is a redeemer and a restorer. And that’s the most valuable lesson I will carry out of these February days…. This entry was posted in Thoughts on faith and tagged Body of Christ, Chatting at the Sky, Gideon, Isaiah 49:16, Perspective on February 28, 2014 by Renee Ratcliffe. Yesterday, our pastor’s message was birthed out of the second chapter of Matthew – a Scripture that we usually study as we are merrily remembering Jesus’ birth and singing “We Three Kings.” Yet, in the midst of February (not the merriest time of year) I found it all the more meaningful to remember the pure earnestness of the wise men’s adoration for Jesus. What better time than a February morning – after edgy days of cabin fever, after January’s resolutions are just a memory and December’s expenses have come due – to worship? These are the days when I remind myself that worship is a response, not to changeable circumstances, but to an unchanging God. These are the days when my heart longs for worship to be as natural and consistent as breathing in God’s grace and breathing out His praise. Not boastful of my own worth. Not matched to my own preferences (or favorite songs). Not limited to a time or place or style. Not conformed to my mood. Not arising only from the mountain top experiences. And so yesterday, later in the day, while thinking about Jesus’ birth and resurrection, the realization hit me that we are almost halfway between Christmas and Easter. I thought of this after walking away from Daddy’s grave. What better place than the cemetery to cling to the incarnation message of God with us and the resurrection truth of us with God, eternally? This is a rainbow charm that I chose to be a part of my “living locket.” * At last week’s jewelry party, I looked over hundreds of charms that could have been chosen. To me, this rainbow is a tiny representation of the mysterious ways of God and of a journey of faith that began almost two years ago when we learned that Daddy’s cancer had returned. The Fourth of July fell a few days after the scan showed the unmistakable spot on his spine. Despite the stormy evening, my parents, husband, daughter, and I continued tradition, hoping that the clouds would break in time for the fireworks. Our usual spot was the top of a tall parking deck in the center of our city, not far from where the fireworks were ignited. We rode the elevator to the top, and as we exited to the parking deck, before us was the fullest, brightest rainbow I had ever seen. Immediately my heart leapt with hope. Taking that brilliant rainbow as a sign, I locked arms with Daddy. 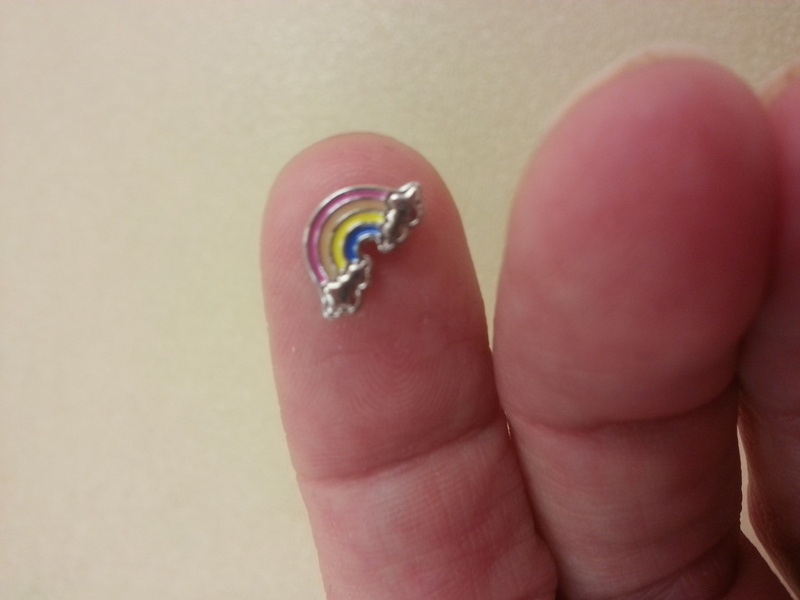 Many months later, I look at a rainbow charm perched on my finger and I think of Daddy. You and I know how things turned out. How could I have said that everything would be alright? How would I know that? How could I claim that? I was just a Daddy’s girl who, wanting more than anything at that moment for that ugly spot to vanish, grasped for any promise of hope. My Daddy is alright. He is. The cancer IS vanished. No, this is not the way I wanted. Heaven wasn’t the healing I hoped for at the time. Now it’s February. My feelings are not merry but my mind is made up. It has to be. This is the only way I know how to do faith. Perhaps it’s not always natural and consistent. But the Holy Spirit fills my spiritual lungs with grace and mercy every single day. This is the air that travels to the deepest parts of my soul and resurrects trust within my heart and mind. One day the storms will pass, the clouds will part, rainbow colors will spill through, and hope will be fulfilled. Whether a particular hope is realized on this side of Heaven or not is not up to us, but God does what is right and good. His faithfulness is as sure as the star in the Bethlehem sky and the scars on Jesus’ hands. The ways of God are mysterious alright, but would I want it any other way? I can barely comprehend all the features on my phone, so if I’m honest, I don’t want a God that I can figure out. This God, who is beyond my understanding, is able to do beyond what I can see or put into prayers or claim for this life. And while that can be frustrating, it ultimately is my comfort. Because if hope were for this life only, it would be a mocking burden beyond what I could bear. While Paul was heavily, frequently burdened by all kinds of persecution and weaknesses, his story includes many physical and spiritual deliverances. But not always. It was through dangers and darkness where Paul found Christ’s strength in weakness and imperishable hope in a perishing body. “So we do not lose heart. Though our outer self is wasting away, our inner self is being renewed day by day. For this light momentary affliction is preparing for us an eternal weight (baros) of glory beyond all comparison, as we look not to the things that are seen but to the things that are unseen. For the things that are seen are transient, but the things that are unseen are eternal” (2 Corinthians 4:16 – 18). In months of suffering, there was nothing “light” about Daddy’s illness. There’s nothing “light” about our present grief. Except that “light” is not meant in terms of importance to us in the here and now but in comparison to the glory, victory, and freedom that we will know then. In this passage, it’s clear that Paul’s mind is made up. His hope and his worship don’t arise from his feelings but from his focus upon God with us and us with God, eternally. The glory to come will be so momentous, so weighty that words to describe it are mere wisps in the air. “Eye has not seen nor ear heard what God has prepared for those who love Him” (1 Corinthians 2:9). Lord Jesus, breathe on me. Breathe faith into me so I can trust that all my burdens are as light and momentary as a human breath in comparison with the glorious joy and healing of Heaven. Breathe worship into me. Let all my hopelessness, pride, distractions, and idols be crushed by the weight of Your worth and eternal glory. Thank You for the promise that the sufferings of this present time are not worth comparing with the glory that is to be revealed to us. I am so grateful for signs of Your love and Your power — the star in the Bethlehem sky, the nail-pierced hands. And rainbows. In You, Lord, everything is going to be alright. Amen and Come, Lord Jesus. This entry was posted in Eternity in Our Hearts, Fighting for Joy, Thoughts on faith and tagged eternal life, Faith, grief, Hope, Trusting God, worship on February 17, 2014 by Renee Ratcliffe. “The Weight of My Worth” – The title, in these five words, captured the previous five years of my life. 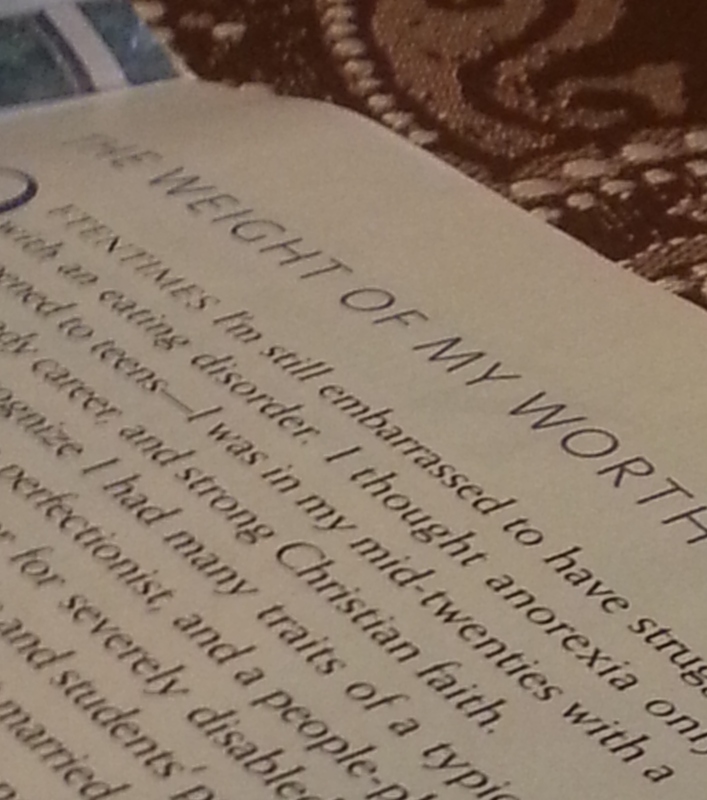 I had the opportunity to share my story with a women’s magazine, and “the weight of my worth” summarized my journey into perfectionism, brokenness, and finally healing. After years of taking baby steps forward and giant steps backward in my recovery from an eating disorder, a Christian counselor introduced me to a book that opened a door into freedom. Having absolutely nothing to do with nutritional guidelines or eating habits, it was unlike any book I had been advised to read. When something other than God becomes a gauge for your goodness, it becomes a god. And some measuring sticks aren’t attached to numbers, yet they remind you that you’ve come up short (again). The job went to someone else or you missed the cut or the invitation never arrived. Yet if we will accept by faith that we are loved immeasurably by a limitless God, all the other measures that say “you’ve arrived”/”you’re accepted” or “you’ve not arrived”/”you’re not accepted” are limited in their power to define or dishearten us. While we are preoccupied with making ourselves worthy of love, God has loved us all along. Are you weary, friend, of trying so hard? The weight of your own worth will exhaust you of any enthusiasm and joy in life. Are you discouraged because you can’t fit your own definition of goodness? The truth is that God loved you before you could move the scales of goodness or worthiness one single ounce. Knowing that we can’t do it on our own, He placed the burden of measuring up to His holiness upon His Son. The original meaning of the word “glory” is “to be heavy” or “to weigh upon.” God’s glory is weightier – or more momentous, more powerful, and more significant than any created thing. We see in Scripture that God’s glory knocks people right off of their feet. The weight of God’s worth knocks away all the props that once held us up. And when we find ourselves on our faces, we come to realize that trying harder is like putting a band aid on major cracks in the foundation. As one who has been face down in the debris of a broken life, I want my story to remind us that God’s love cannot be achieved. God’s love is meant to be received. In return for this priceless gift, God doesn’t ask us to prove that we are worth it. He desires us to worship. And in doing so – in ascribing the highest honor and worth to Him and not ourselves – we are freed to let go of our controlling and striving and let God be God. When we live as if we truly believe that God delights in us, our load lightens. Instead of grasping for another rung on the status ladder, our hands become offerings of grateful worship and service. “You see, we don’t go around preaching about ourselves. We preach that Jesus Christ is Lord, and we ourselves are your servants for Jesus’ sake. For God, who said, “Let there be light in the darkness,” has made this light shine in our hearts so we could know the glory of God that is seen in the face of Jesus Christ. We now have this light shining in our hearts, but we ourselves are like fragile clay jars containing this great treasure. This makes it clear that our great power is from God, not from ourselves” (2 Corinthians 4: 5 – 7). Paul describes us as jars of clay, and the treasure inside is the precious message of the Gospel. Our credentials, abilities, and winsome personalities are dim flames compared to Jesus’ glorious, dark-dispelling light. Through the fragility of a clay jar, with its flaws and cracks, the glory of God shines. If we can’t trust that we are accepted, we can’t be authentic. But if we will forget that gauges that once measured us and if we will receive grace, we will be vessels for God’s glory – flawed, perhaps, and fragile, but genuine. I truly believe that God is glorified when we are genuine – when we authentically share our lives and our struggles and our weaknesses – and allow people to see that we can only press on because inside of us lies a hope and a strength that is not our own. So when the weight of my worth is based upon what I do, it is weak and unable to withstand the pressure of failure, doubt, and criticism. But when the weight of my worth is based upon who I am – a jar of clay that contains the light of Christ, it is strong and reinforced by His acceptance. It doesn’t crumble under the strain of self-reliance but relies on the Light within to radiate God’s glory. It doesn’t need to try harder. It trusts. So today, remember with me that the weight of our worth is a load we are not meant to bear. That burden was pounded into the ground with the Cross. Join me there as we exchange this weight for worship. (Paul continues in 2 Corinthians 4 to speak of suffering in comparison to God’s “eternal weight of glory.” In Part 3, I’ll share why this gives me hope). “The only thing you can grasp without damaging your soul is My hand.” ~ Jesus Calling: Enjoying Peace in His Presence by Sarah Young (entry for February 5). This entry was posted in Authenticity, Fighting for Joy, Living in Grace and tagged acceptance, eating disorder, God-confidence, Grace, healing, rejection, Trusting God on February 6, 2014 by Renee Ratcliffe.